Wake up to beautiful skin, every day. 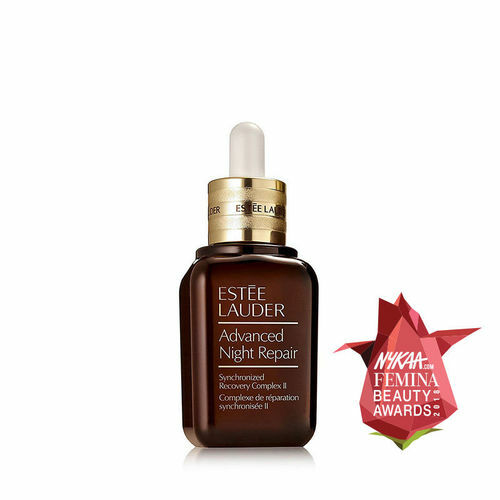 Estée Lauder’s Advanced Night Repair Synchronized Recovery Complex II promotes a natural nighttime purification process, vital to younger-looking skin. The No.1 Repair serum address all key signs of visible aging with exclusive ChronoluxCB™ Technology for more comprehensive and precise night time repair. Lines and wrinkles look significantly reduced. More than 75% of women felt their skin looked more youthful in just 4 weeks. Skin feels smoother, hydrated, stronger. 82% felt their skin was immediately hydrated. Skin looks younger, radiant, more even toned. 83% felt their skin looked healthier, fresher, more rested in just 4 weeks. Explore the entire range of Serums & Essence available on Nykaa. Shop more Estee Lauder products here.You can browse through the complete world of Estee Lauder Serums & Essence .Alternatively, you can also find many more products from the Estee Lauder Advanced Night Repair Synchronized Recovery Complex II range.